Would buy another one if I had to. Works great. Easy install. I've had this Bass knob for about 5-6 months (bought it from here) It works amazing for what it is but now when i use it it will mess up all the time. the rcas must be coming loose.. for instance when i turn the bass knob up it turns the right side of my speakers off :/ quick tip when using this Tape the RCAs with electrical tape after you connect them so they stay tight otherwise this might happen to you. Other than that Get it while its cheap. So worth it. I've got mine Mounted on the center Console right next to me In case i see a cop. Works Great! lol oh and another Huge Flaw i forgot the Bassknob actually started to Freely spin by itself after awhile Then i had to take it apart and glue it :/ fixed it though.. WORTH THE MONEY. Bass knob works great when its all the way down it actually kills all the bass incase you dont want to hear any or if your riding with people and they dont like it. Plus you cant beat the price! Works well, haven't had any issues out of it. The profile of the housing could be a little slimmer, it barely fits between my seat and console on my F-150. But other than that, great product. Be careful with it though, the top part of the knob can come off of it if you pull on it when it's mounted. Not a bad feature of the product, but i put a tiny amount of silicone on mine and stuck the knob back on it. No issues past that. Great for the price!!! Definantly a good value for the money! It works exceptionally well for the cost of the item. This is th best alternative to a bass remote. Easy mounting and simply easy to use. Turn the knob and control from your seat or where you want to mount it. Simply amazing. Loses a little bass but still easy to control. Super cheap and extremely effective. Works like a charm!! As good as an expensive one. I bought this 6 months go to replace my remote bass that came with my rockford amp. This one has good control over its full range. The only downside is that it only turns down the amount of bass. Easily accounted for by turning up the bass gain on the amp. I would recommend for any one who is looking for a universal remote bass control. Factory remote bass controllers are better in my opinion. This product is amazing. I have a Kenwood 1000w max amp hook up at 2 ohms to 2 12inch subs. Now I can put my boost to max and my gain half way and still be able to adjust exactly where I want my subs to be at. With this knob I can turn my subs completely off if there is a cop around or max out my subs when I wanna show off. I love this thing and I can honestly say that its better then some of knobs that actually come with the amps. My friend has a SSL 2000w max amp on the knob it comes with doesn't turn off the subs when needed. This is an Amazing product! PAC HAS DONE IT AGIAN!! HIGHLY RECOMMENDED IF U DON'T HAVE A KNOB FOR UR SUBS!!!! Worked out quite well for me. Been using it for going on 2 years in 2 different vehicles with nearly no problems. Only problem so far is it seems to get a dead zone in the middle when its cold out. Otherwise works perfect especially with my Clarion equalizer. Anyone who is looking at this page right now, you obviously either know what this is, or are looking for a replacement 'bass knob', look no further. The LC1 is not a bass knob, it's full control over your output signal from your source unit. Far superior control over any 'bass knob'. Real simple and easy too use, I love it. Bought 3 of them for all my vehicles. This is definitley a good remote. You get way better control of your bass than with remotes that come with most amps. I definitely recommend this product. I wanted to let you guys know that I bought this for my car and it is awsome. Its better than the bass control knob that comes with your amp that most people are use to, I think bc you know there are some times at certain places that you just can't have loud bassy music rite? well, with this item you can turn the gain to your amp all the way off and still enjoy your music loud but with no bass. Then when cost is clear turn turn it up to suit your needs. Sounds good and I like it alot. 5 star A+ item. You'll love it! You will find out with in a day of what I am talking about. This thing is AMAZING! And cheap, does just what i want. best part is that its universal so it will turn the subs or whatever amp you have on it all the way down, not just until its low. it seems to be off or on even when gains are set with o-scope. over all its not a bad product. I was looking for a volume control and this unit was exactly what I need. It has been in use for 2 months and is working perfectly! Not much to it. Its a potentiometer wired into 2 channel RCAs. Its a good, cheap alternative to other expensive options. It does not feel 100% solid, I feel like sometimes I might twist the knob off. But its been 6 months and I have not so far. So be gentle with it. Mounted nice in my dash. I would recommend this to a friend. it is a good thing to have when you want to turn the base up or down depending on what type of music you listen too. I bought this cause I didn't have a bass knob for my amp. Turned out that this is better than a bass knob. Very easy to hook up and use. Great product! i would recommend this to people who need a bass remote very good! bought it 6 months ago and still working overall rating i give this a 10! I have the sub volume control between a Pioneer AVH-P3200DVD headunit and 2 12-W0's with a small 400W dual channel audiobahn amp, considering size of the amp, subs hit pretty well and the PAC LC1 offers great sub control, especially here in MA where there are decibel laws, you can just turn it down really quickly when passing cops =) I have it mounted inside my center cup holder console which is a hideaway unit, great product, feels very solid and heavy material, smooth dial and good mounting points, highly recommended for RCA sub vol knob! Best hands down, from off to full blast I have perfect control now. Great product, works great with my pioneer head unit. Would recommend to anyone who doesn't have the capabilities for a bass controller on their amp. I am currently using this to control the level of my sub-woofer in my car. it allows me to easily adjust the bass output that goes to my amplifier, rather than making the adjustments in my stereo settings. Works great and is easy to install. no problems at all so buy it!! This works really good..but the only thing that isn't good about it is that it only goes from 0db to -12db..which doesn't hit hard with most music besides rap. The features list should tell this, because I would not have purchased it otherwise. Great little addition to your stereo either in car or in home. Works great, could be a little slimmer, but its defiantly worth the money. 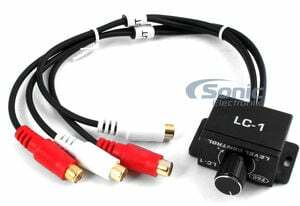 I've had 2 of these, the Scosche EFX RLC, NVX XBRC, and the CT Sounds Universal Controller with voltmeter. Long story short, this one is much better. The PAC LC-1 is not close to being linear. (i.e. touchy at first with hardly any difference after halfway. It can also introduce distortion into the system. RCA's come disconected from the circuit board with minimal pressure. Skip it, buy the EFX RLC. Cant go wrong with it for how cheap it is! Hooked it up in my 2k Durango. I turn the knob to the right, the sound goes up, I turn it to the left, the sound goes down. It didn't introduce any discernible sound to my system. Nothing fancy, get's the job done as advertised. Will recommend to anyone who asks. I recommend this product! Great value delevery and everything. Very precise gain knob. Set it just how you need it. I put this in my car about a month ago and it works pretty well, it also got me out of a few tickets! I would recommend it to anyone! I bought this for my MTX Jackhammer amp and it works great. It controls 2 10" subs behind my seat. If you want a universal knob get this!